This unique metric converter doubles as a pencil cup. It was also available in black with white lettering. Has two movable rings. 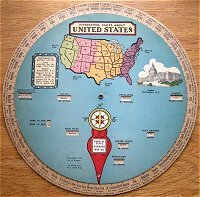 There was also a slide rule version. 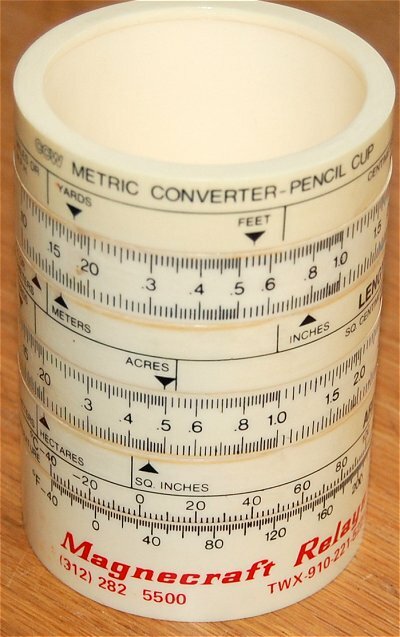 Cup was made in Denmark by the CCW Slide Rule Co. 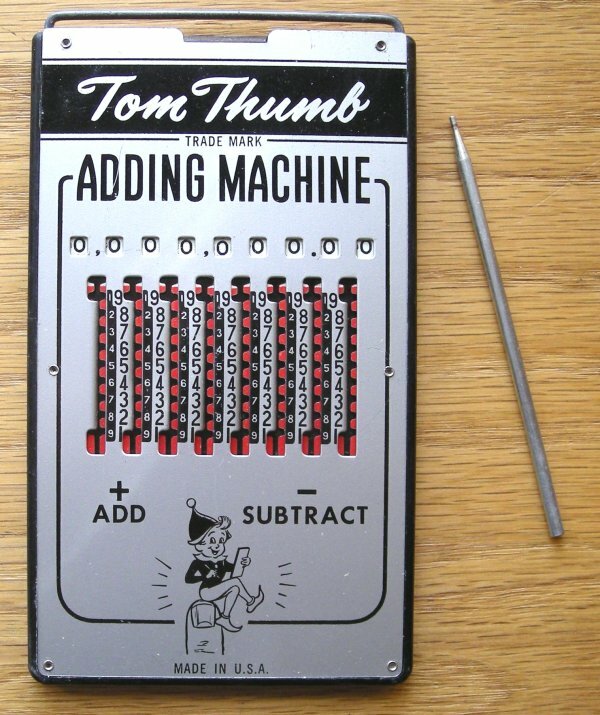 This mechinical calculator is from the early 1900s. 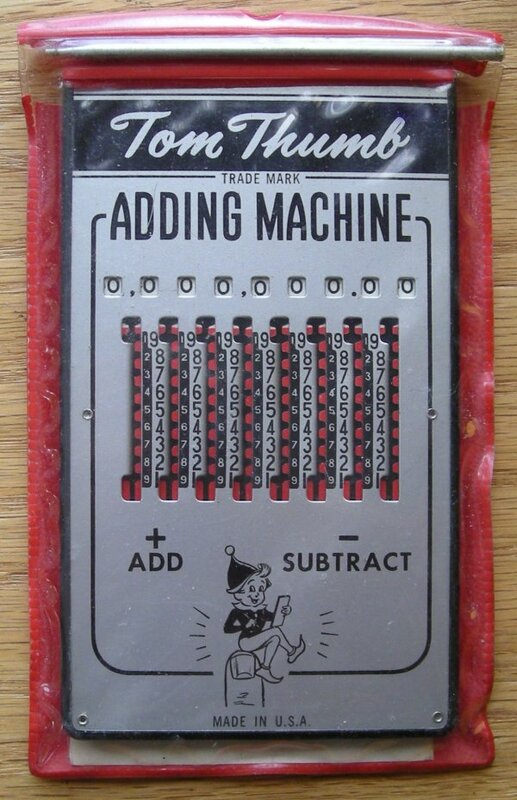 It was manufactured by the Lightning Calculator Co. of Grand Rapids Michigan. 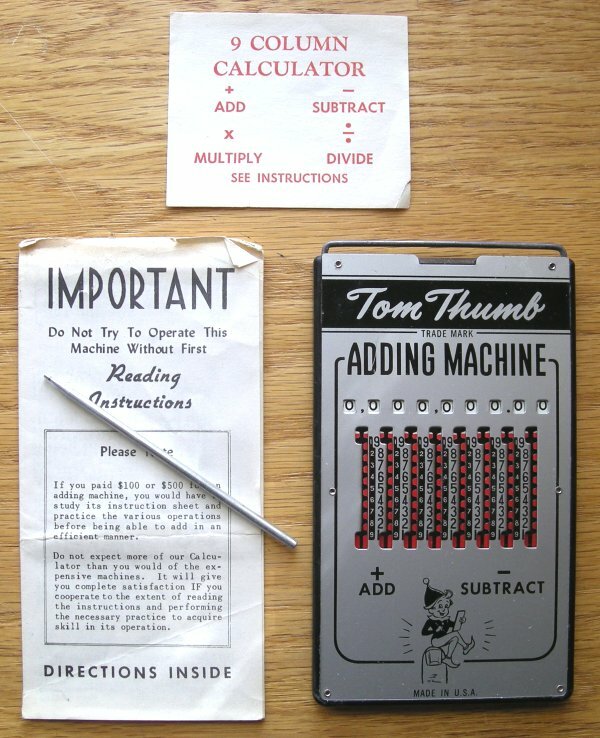 There was a much later version manufactured by Lightning Adding Machine Co., Inc. of Los Angeles CA. 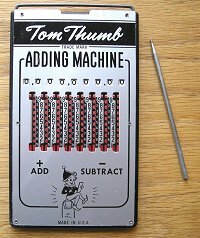 Size: 13.25" X 3.75" X 2.25"
This mechanical adding machine uses a stylus and does simple addition and subtraction calculations. You can also do multiplication and division but it is a pretty convoluted process. You clear the machine by pulling the bar out at the top. These were popular in the 1950s and 1960s. 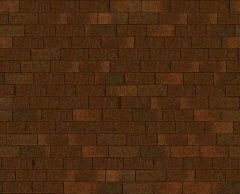 Size: 3¼" X 5¾" X 3/8" thick. 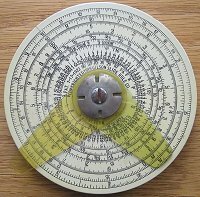 This Gilson Circular Slide Rule is the Midget Type IV manufactured in 1931. This model is two sided and also has a cursor on the back. It's a 4-1/16" diameter aluminum disk with printed black scales on white celluloid enamel. 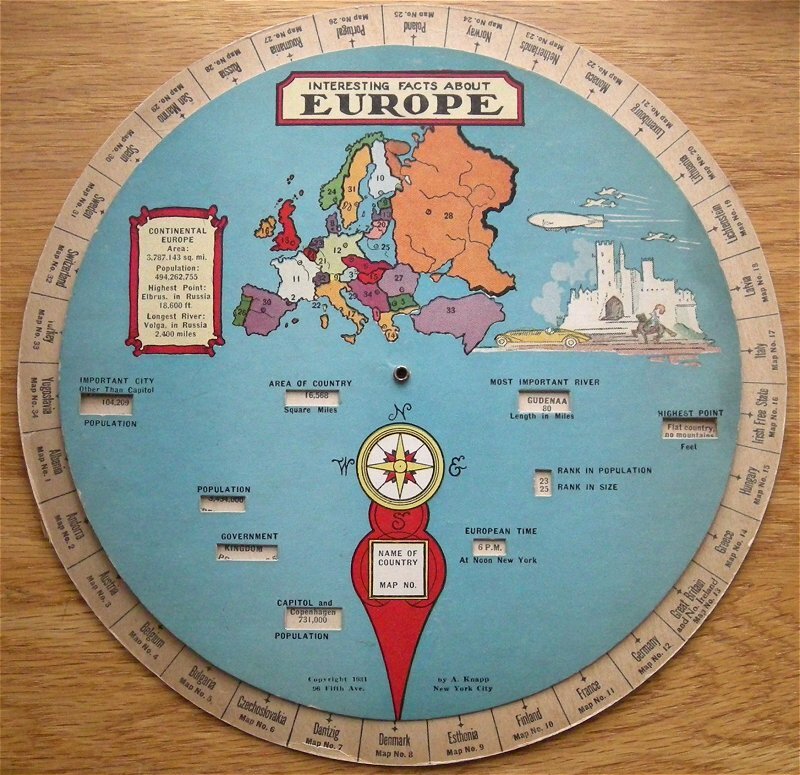 The Fun Facts wheel chart features the United States on one side and Europe on the other. Just dial up a state on the U.S. side or a country on the Europe side. I also found references calling it "The Wheel Of Knowledge" although it is not printed anywhere on this chart. It has a copyright date of 1931 and was distributed by A. Knapp of New York City. It's fairly large at 10 inches in diameter. 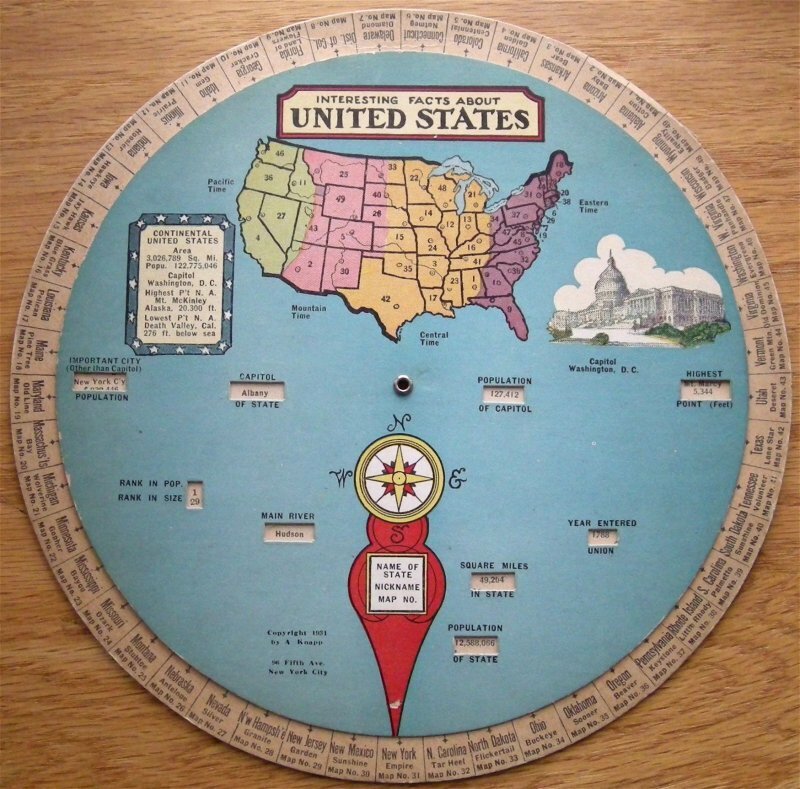 There was also a smaller United States version given out by Kelloggs. Click on the photo for a look at a couple interesting slide rules. The one pictured top left is a 6" rule and probably a promotion given out by Solid State Electronics of Illinois. 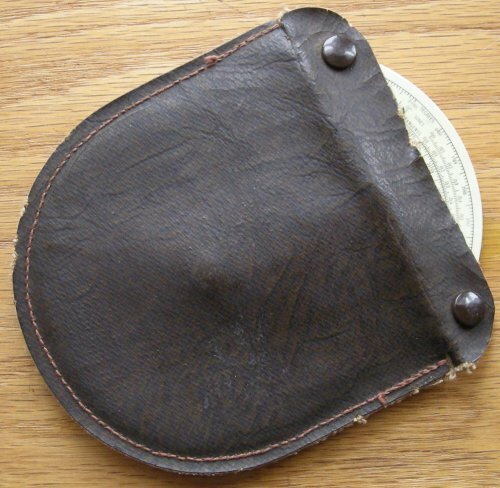 It comes on a nifty little leather pocket protector. #601-1 made by Diwa in Denmark. The second slide rule is my favorite to actually use. It's made by Nestler of Germany, model Nr. 0291. It works very smooth with no sidplay. Wish I had this one in High School. It sometimes took two people to move the cheap plastic one I had. 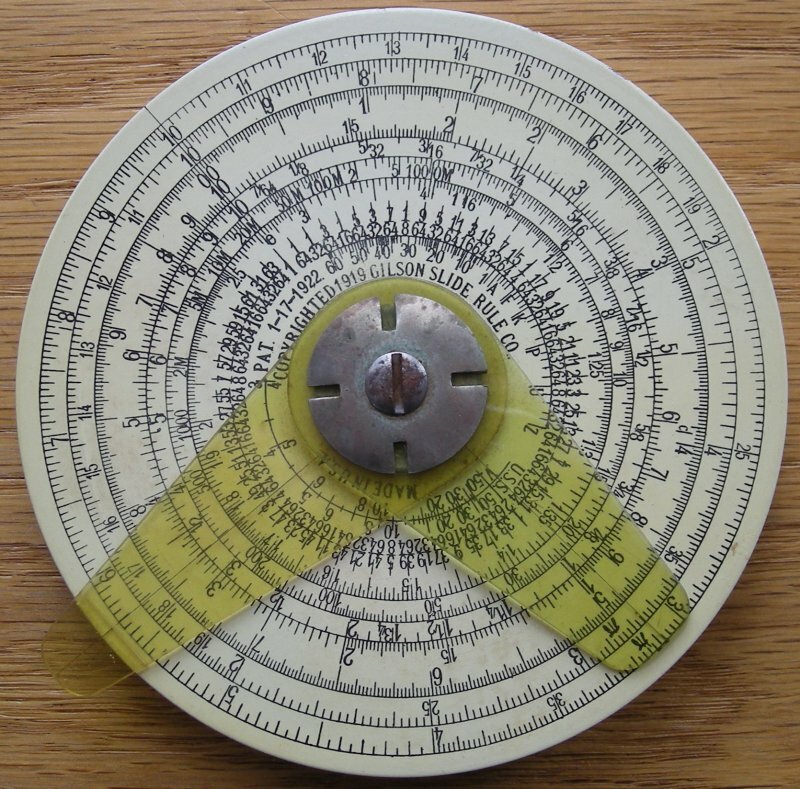 This slide rule was manufactured by Pickett. It's model number N-515-T and is made specifically for electronics use. 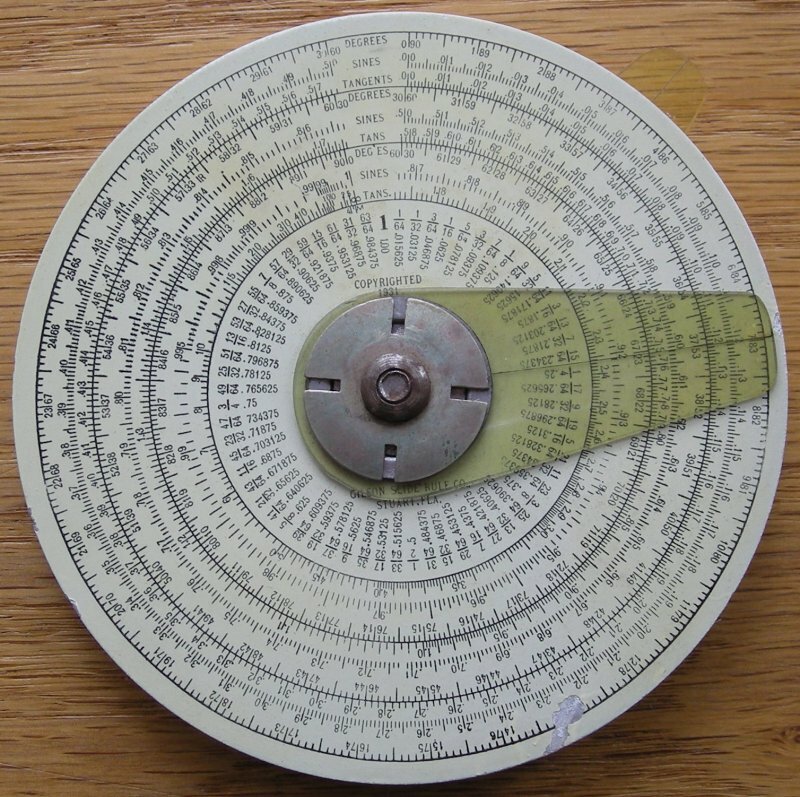 This slide rule was distributed by the Cleveland Institute of Electronics. One side is a standard engineering slide rule. The reverse side has scales for reactance and resonance, and electronics formulas such as ohm's law for AC and DC circuits, parallel resistance, coupled inductance, frequency and wavelength, temperature conversion, etc. The heck with a pocket protector. The leather case has a removable belt loop for those that wanted to look really geeky.